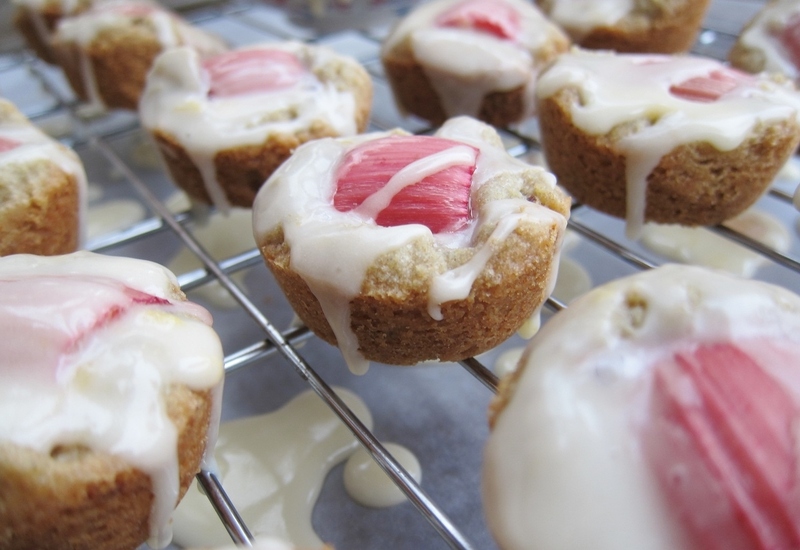 I admit it: I jump on the rhubarb bandwagon every spring. Once they catch my eye, the pink stalks distract and excite me, luring me in with their short season and tart, fruity flavor. This year, I’d gone to the market one afternoon looking for dinner ingredients, and instead came home with three pounds of rhubarb (whoops!). After a delicious experiment with sweet almond and a scrumptious batch of this, then these, I started craving something crisp, buttery, and new. The mildly herbal and nutty flavor of rye bread had been on mind lately. (For me, it’s as delicious as it is nostalgic; my Jewish grandma swore by her pastrami on rye, said only in a Bronx accent.) After playing with some silky-soft rye flour, I quickly realized I was also longing for the signature caraway seeds that often accompany it — so I got myself some of those, too. 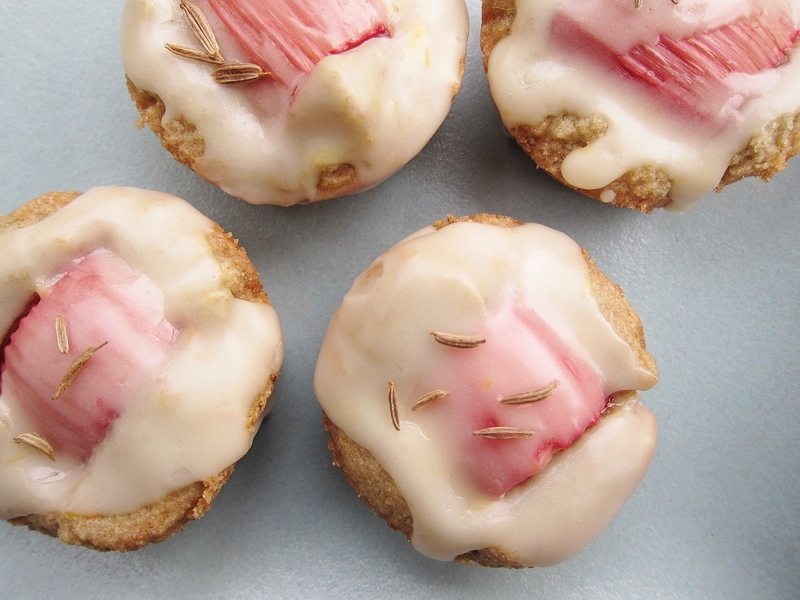 With these two treasures and bit of vanilla and orange zest, my new shortbread dough was rich and flavorful with a whisper of earthiness: perfect for nestling a hunk of juicy, tangy rhubarb. For sturdiness and a molded shape, I reached for my mini-muffin pan. The result was a satisfyingly crisp cookie whose structure held up to the succulent fruit while offering a delectable, buttery crumb. 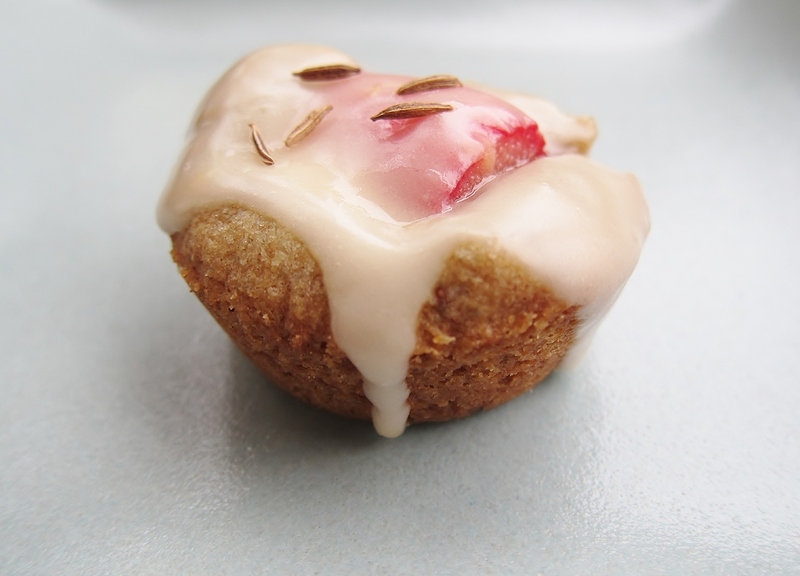 Finally, I topped them with a citrusy glaze that added the perfect sweetness (please don’t skip it — and if you want to booze it up a bit, see note at end of recipe). As a finishing touch, a sprinkle of crackly of caraway seeds heightened the optimal balance of warm and bright flavors. Preheat oven to 325 F with a rack placed in the center. Generously grease 16-18 cups of a mini muffin pan; set aside. 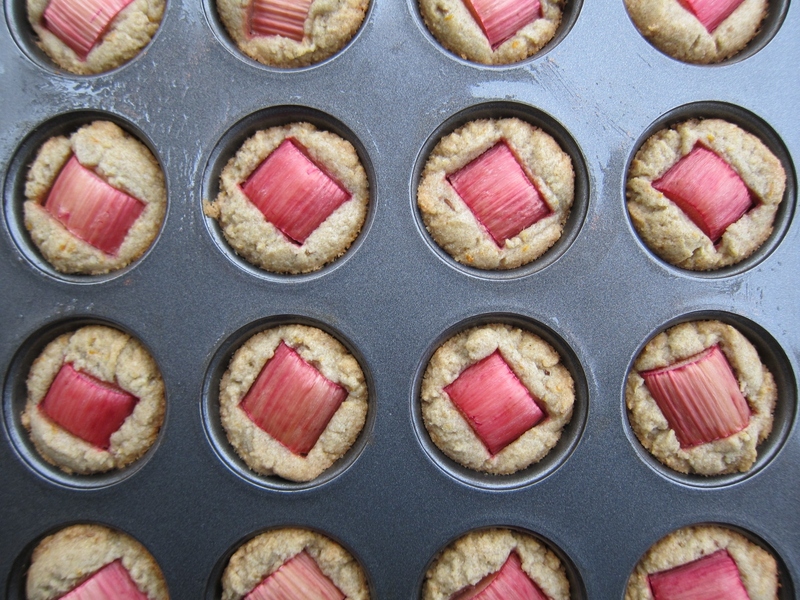 Cut rhubarb stalks crosswise into 16-18 pieces, each about ¾” wide. Set aside. Rinse, dry, and finely zest the peel of the orange; set zest aside. Juice the orange, straining and discarding any seeds. Set juice aside for glaze. 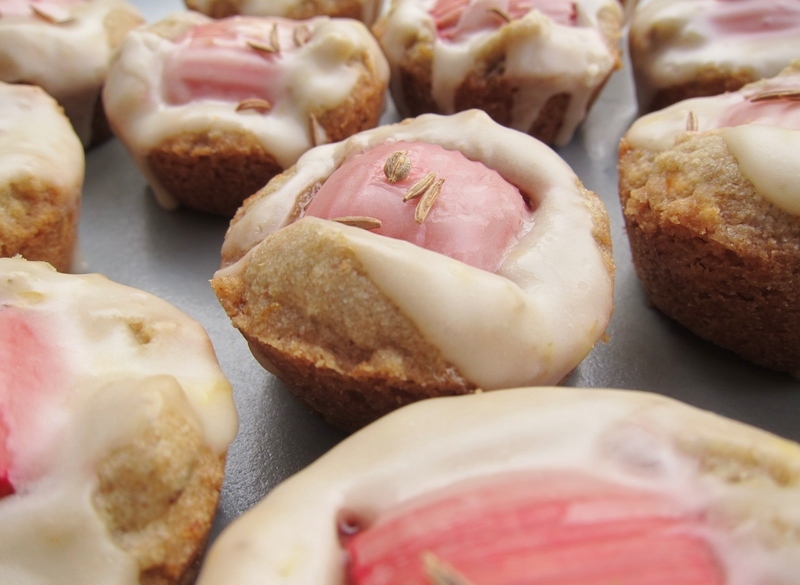 Set aside ½ teaspoon whole caraway seeds aside for topping. 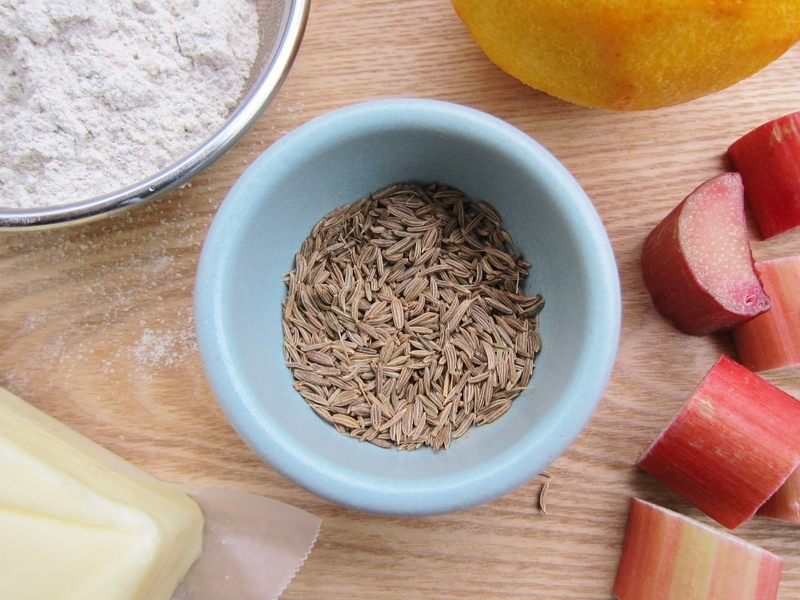 Use a mortar and pestle or spice grinder to coarsely crush the remaining teaspoon caraway seeds. Sift sugar, both flours, and salt into a mixing bowl. Whisk in the crushed caraway seeds. Add ½ cup butter and the vanilla; beat just until dough holds together. Beat in the orange zest until evenly distributed. If dough is stubborn about sticking together, knead gently using warm, damp hands. 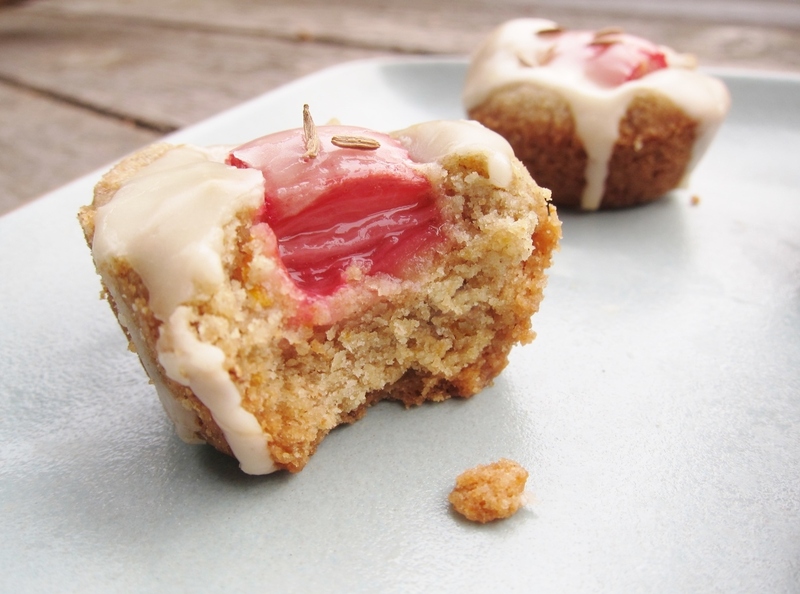 Using one tablespoon of dough per cookie, distribute dough among the greased muffin cups. You should have 16-18 filled cups. 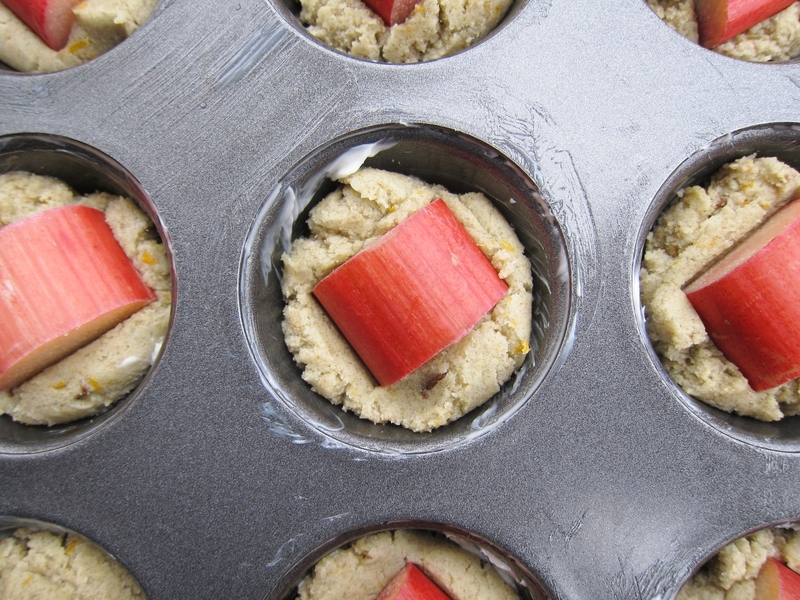 Press a piece of rhubarb curved-side-up into the center of each dough ball, letting dough push to edges. Bake 20-25 minutes, until edges of cookies are toasty brown. Make the glaze: Sift powdered sugar and a dash of salt into a bowl. Add the orange juice one teaspoon at a time, whisking well after each addition. You’ll need about four or five teaspoons juice total. 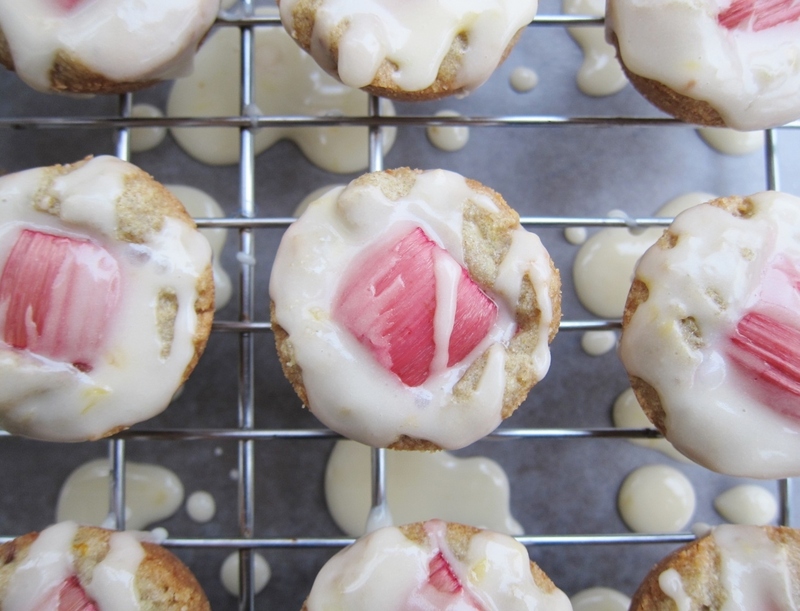 Glaze consistency should be pourable with a slow drip – not too thin. 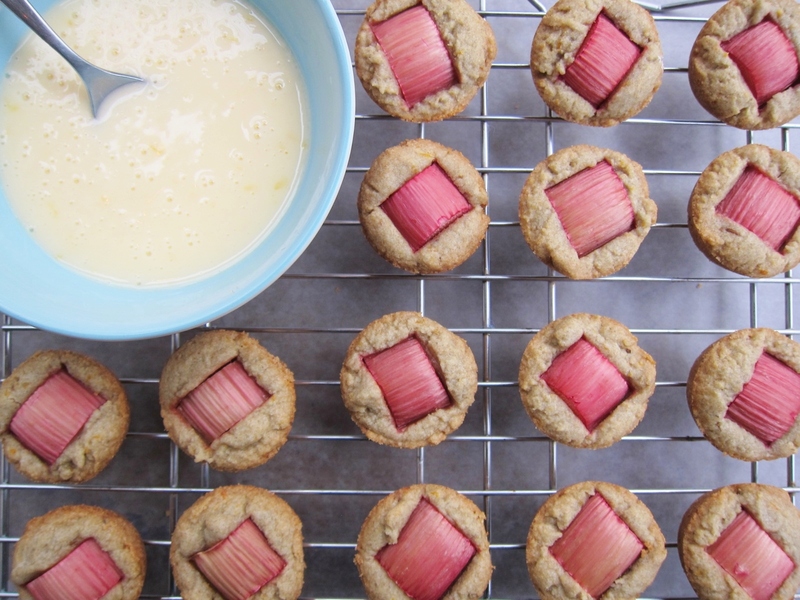 Spoon glaze over cooled cookies, allowing runoff over edges. Stir regularly while glazing cookies. 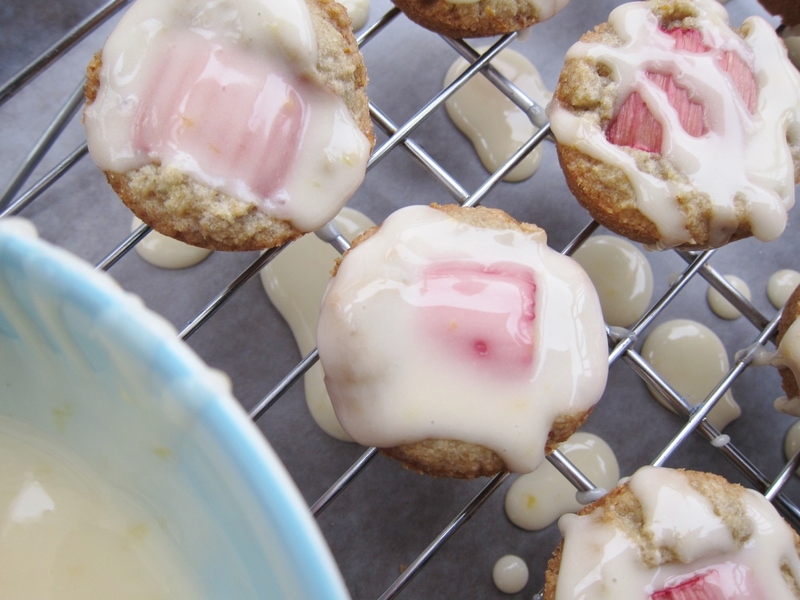 If desired, scrape up the dripped glaze below and re-use. Working quickly, sprinkle each wet cookie with a small pinch of whole caraway seeds. Let icing dry completely until crisp, then devour! Keep extra cookies chilled or quite cool in a closed container. Maybe next time… If you’d like to echo the rye flour with its boozy cousin, replace the orange juice in the glaze with rye whiskey; this will add a welcome warmth and kick. If you’d rather not use rye flour at all, feel free to replace it with all purpose flour for a more traditional shortbread; you can skip the caraway, too. In this case, lemon zest makes an equally delicious replacement for orange, if desired, and rosemary would be divine in lieu of caraway. 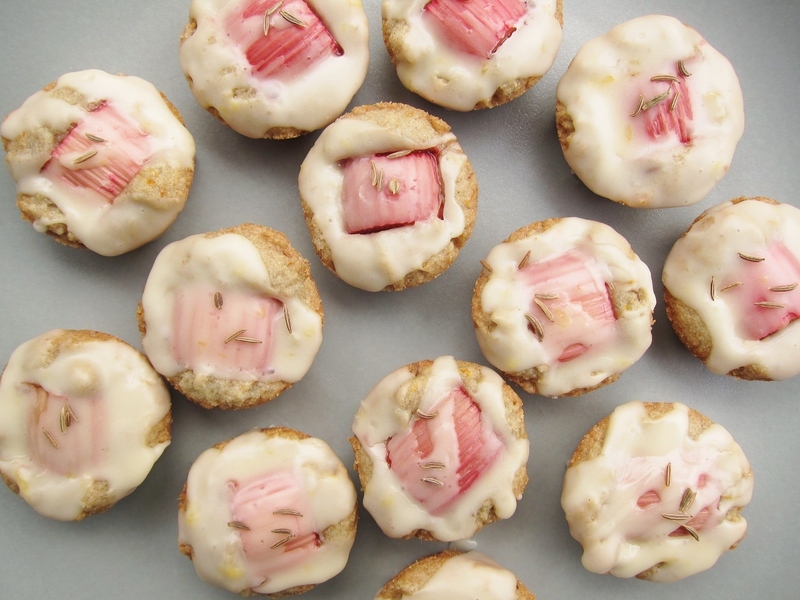 This entry was posted in Baking with Herbs, Cookies & Bars, Sweets and tagged caraway, caraway seeds, rhubarb shortbread, rhubard, rye, rye flour, shortbread. Bookmark the permalink. These look so delicious, and I LOVE all the wonderful photographs! All photos and recipes copyright © 2011-2019 butter, sugar, flowers. All rights reserved. Do not use or reproduce without explicit credit and link to original content. Contact me with questions.